"The closer the fight gets the more I’ve allowed myself to get caught up in the Fury story. But, in reality, he’s a fighter who has been out of the ring for a long time, has gained lots of weight then had to shed it again, and hasn’t been in with a live opponent since Klitschko." December promises to be a massive month for British boxing, especially in the heavyweight division. We get started on Sunday 2 December when Tyson Fury aims to upset the odds and silence an army of doubters by travelling to Los Angeles and dethroning WBC champion Deontay Wilder at the Staples Center. In only his third fight since returning from an extended absence from the sport, spent fighting personal demons, Fury steps into the ring with one of modern boxing's most destructive fighters, a man with an earth-shattering 98% knockout average and 40 wins from 40 starts. Critics say he's mad, and that's the ones holding their tongue. Does Tyson Fury have a chance in America? He'd have you believe so, but the betting says otherwise. Since famously beating long-term, heavyweight ruler Wladimir Klitschko in Germany to win an alphabet of world titles in November 2015, Tyson Fury has fought only twice. Both were non-title fights, against modest opposition and produced a combined total of 14 rounds. Hardly ideal preparation for a bout with the game's hardest hitter, but it's difficult not to admire the challengers' self-confidence and he has told everyone who would listen in the build-up to this one he feels good enough and strong enough to go back into the lion's den and leave with the head of the beast. Thirty-year-old Cheshire resident Fury made a long-awaited comeback in June of this year when stopping Macedonia's Sefer Seferi in four rounds in front of an appreciative Manchester audience. He followed that with a quick-fire return to the ring, beating durable Italian Francesco Pianeta at Windsor over 10 rounds on the undercard of Frampton v Jackson. Neither performance was terribly convincing, but it was always about getting back in the ring, back under the lights and back in contention. Many fight fans thought the Englishman was still four or five fights away from a major challenge, so were shocked to see this bout announced. Punters appear to have stuck with their initial thoughts and there's a chunky [2.6] available on the Exchange about the title changing hands. Deontay Wilder enters the ring with everything going for him, certainly on paper. A 6ft 7inch athlete at 33-years-old, he's in the prime of his boxing career. Undefeated in 40 previous fights, his record shows no less than 39 knockout wins to date. That run has earned him the WBC title, defending his trophy seven times, all wins coming comfortably inside the distance. The spare points victory on his record came over the rugged Bermane Stiverne back in January of 2015 but it was a result he mended in a 2017 rematch when knocking the same opponent out inside a round at the Barclays Center, Brooklyn. The home champion is confident he'll keep up that trend by adding the scalp of Tyson Fury. The Bronze Bomber was last seen edging a fascinating contest with talented Cuban Luis Ortiz in March of this year, inflicting his opponent's first defeat in the process. Despite being out-boxed for large parts of the bout before the end - the scorecards locked at 85-84 in the victor's favour - Wilder produced his get out of jail free card, knocking his rival to the canvas in rounds one and five before dropping him twice in the 10th, referee David Fields calling it at 2.05. 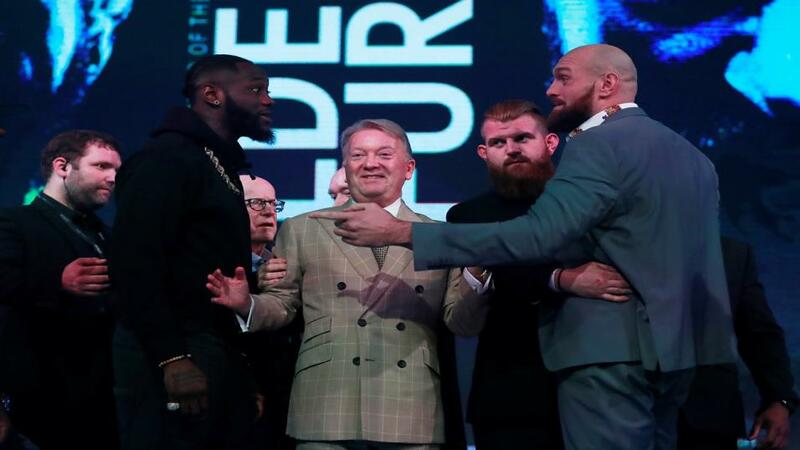 That performance would have filled Team Fury with confidence and there's no doubt the Englishman will look to build up an early lead on the scorecards and stay out of trouble as the bout enters the latter stages. He wouldn't be the first to adopt those tactics however and backers expect it to come to nothing. Wilder is favourite on the Betfair Exchange, [1.66] the best you'll get at present. This column has delivered on the big stage a few times already this season, tipping the winner of Alvarez v Golovkin and Smith v Groves. Keen to continue that run, I'm sticking with my tried and tested method of going with my first opinion. The closer the fight gets the more I've allowed myself to get caught up in the Fury story. But, in reality, he's a fighter who has been out of the ring for a long time, has gained lots of weight then had to shed it again, and hasn't been in with a live opponent since Klitschko over three years ago. All the time Wilder has been healthy, fit, active and winning. I'm also not too sure how you could prepare for a problem like The Bronze Bomber. He looks scrappy at times, true, but you never know what he's going to do and there's not a sparring partner or pad man who could replicate his style. It pains me to say it, as Fury is the better boxer of the two, but I'm taking Wilder for the KO/TKO at 11/10 on the Sportsbook. Those after more can back Wilder in rounds 9-12 at 15/2 (Betfair Sportsbook).